Polymer Science: A Materials Science Handbook, Volume 2 focuses on the chemical structures of polymers, as well as the processes of friction and wear, adhesion, radiation, spectroscopy, and nuclear magnetic resonance. The handbook first tackles the processes of adhesion and friction and wear, including factors affecting adhesion, theories of adhesion, and interfacial and cohesive failure. The book also reviews polymer solutions and fractionation, polyelectrolytes, and electrical properties of polymers. The publication takes a look at the dielectric properties of polymers and far infrared spectra of polymers. Discussions focus on the basic theory of dielectric behavior of small molecules; molecular theories of relaxation in polymers; dielectric behavior and relaxation of polymer solutions; theory of the absorption and dispersion of electromagnetic waves in condensed media; and absorption spectroscopy in the far infrared. The text also reviews nuclear magnetic resonance, radiation effects in polymers, and identification and analysis of plastic materials. 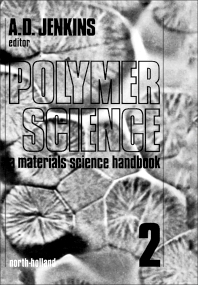 The handbook is a dependable reference for readers interested in polymer science.